Sheikh Hamdan bin Mohammed bin Rashid Al Maktoum, Dubai Crown Prince and Chairman of the Board of Trustees of Dubai Future Foundation, launched the 4th edition of Dubai Future Accelerators. Teams from 12 Dubai government entities are participating in collaboration with top innovative institutions from around the world. 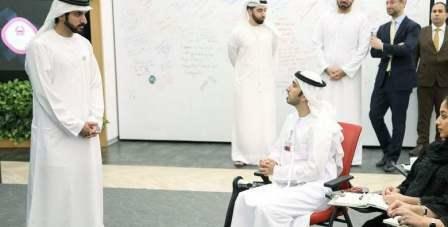 During his visit to Dubai Future Accelerator Headquarters, Sheikh Hamdan said that Dubai leads the way in showing how future governments should operate. Thus, adopting advanced work methodologies to overcome challenges can create solutions. "Dubai continues to build partnerships with leading institutions in the private sector, boosting the development of projects that positively impact the status quo," Sheikh Hamdan said. Accompanying Sheikh Hamdan were Mohammed Abdullah Al Gergawi, Vice Chairman of the Board of Trustees of Dubai Future Foundation and Managing Director of Dubai Future Foundation; Khalfan Belhoul, Chief Executive Officer of Dubai Future Foundation; and Abdul Aziz Al Jazairi Deputy CEO for Strategy and Projects at Dubai Future Foundation. Sheikh Hamdan listened to a briefing on what has been accomplished in previous editions of the Dubai Future Accelerators programme. He expressed satisfaction with the projects that were completed in record time. "We look forward to raising the bar in the 4th edition of Dubai Future Accelerators and finding technology-driven solutions," Sheikh Hamdan added. "The programme helped set advanced work methodologies to tackle challenges in various sectors and find innovative solutions. "The programme allows government entities to foresee and solve future challenges and create active partnerships across all sectors," he concluded. During the visit, Sheikh Hamdan attended a meeting with government entities participating in this edition's programme under the theme "Take Part in Creating the Future." The 4th edition of the Dubai Future Accelerators will see teams working over a period of nine weeks in collaboration with partners from the private sector. Work progression will be divided into eight stages.